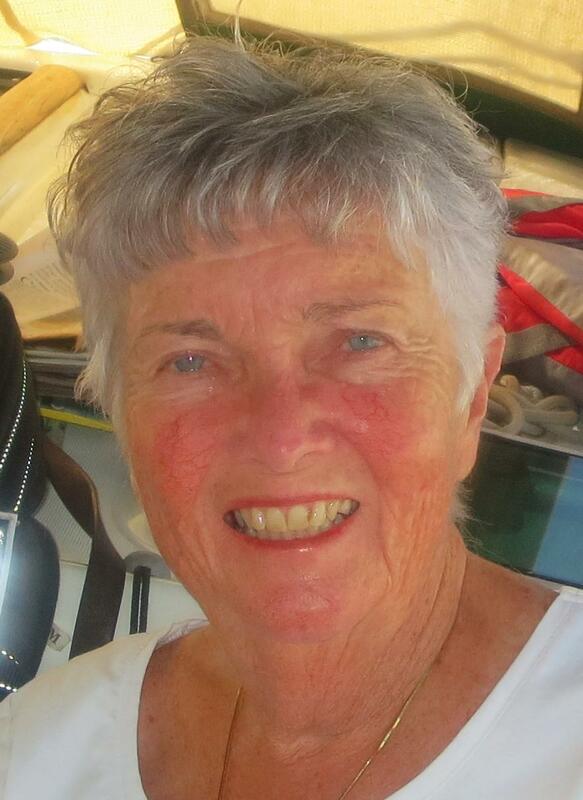 I picked the car up from Enterprise at 10:00 and we were then headed to Winn Dixie for provisions. 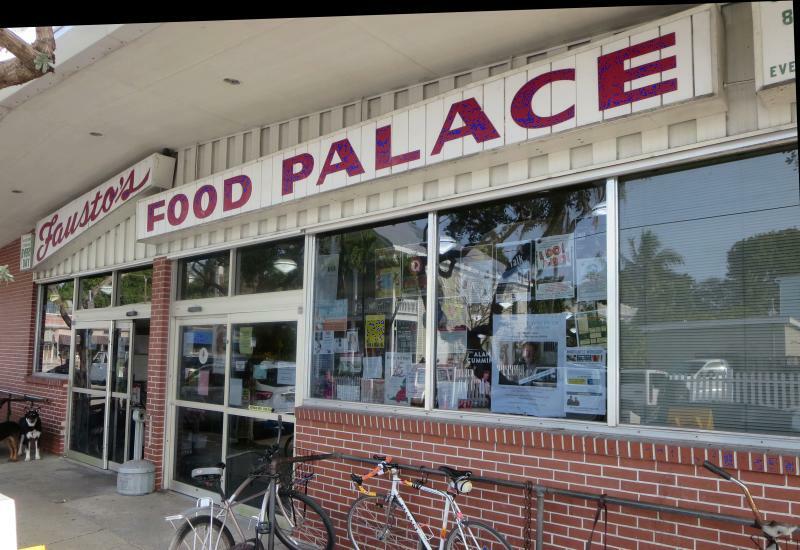 They had everything we needed at a better price than Publix, the other major supermarket in Key West. 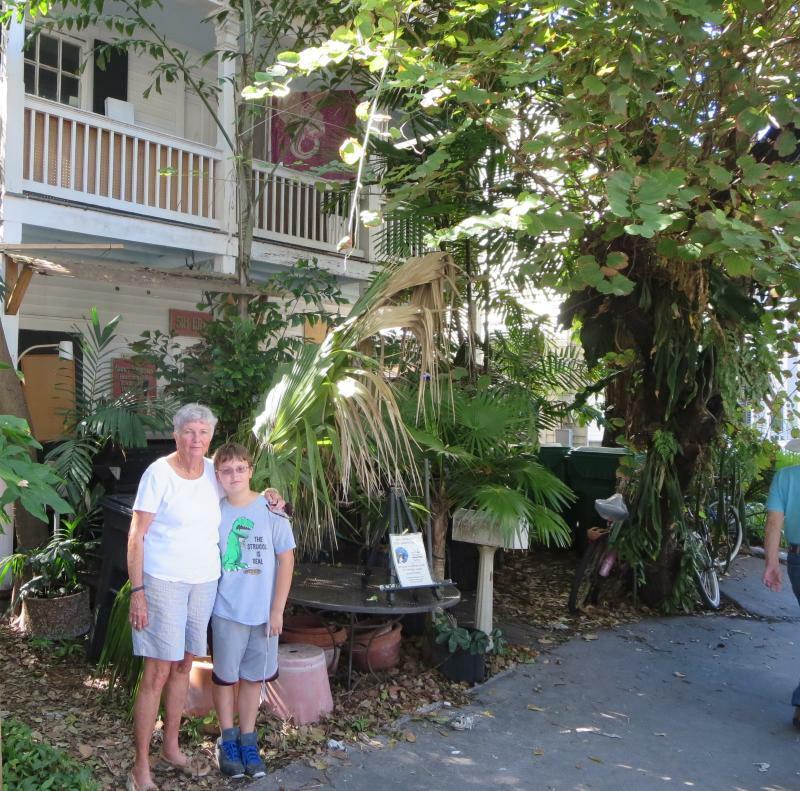 Ann had wanted to see the southern end of Duval Street known as "up" Duval Street since that's the direction of increasing house numbers even though it's southerly on the map. 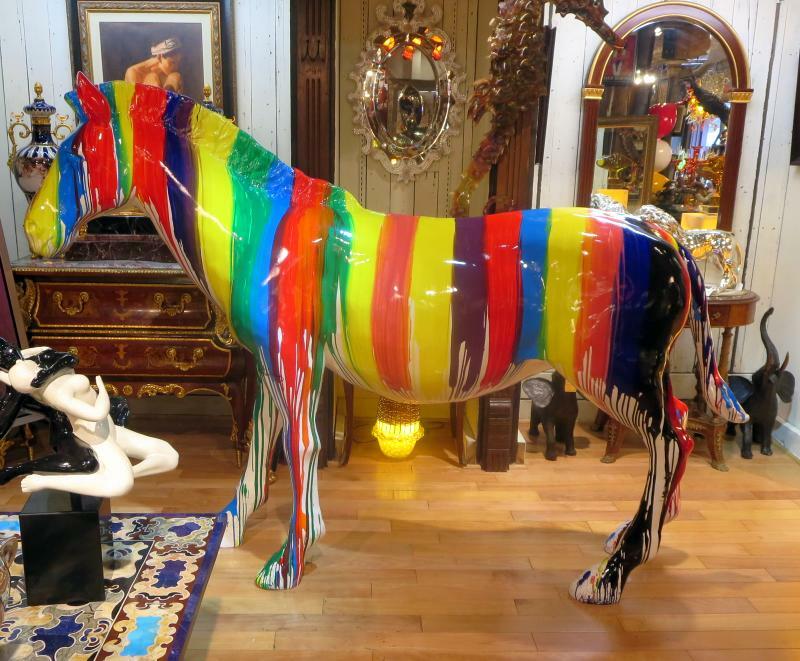 There were several art galleries she wanted to see and one in particular, the Alan Maltz Gallery. The trend over the past few years has been to do photographs on metal. The photos become luminous and are quite stunning, they have a glow to them. We were thinking of having some of our own photos done that way. Aside from just looking at the paintings and photos, Ann likes talking to the artists and share what paper they use, their techniques, their oils or pastels, etc. I guess it's like talking shop. I just like to look at the art but Ann likes to get into the details of how it's done. We dined out at Al Mainah, It's a new restaurant that's only been opened for two months and they don't even have a liquor license yet so you have to bring your own bottle. That part actually saves money, especially since they do not charge an "uncorking fee" which some do to compensate for the loss of profit from liquor sales. The restaurant specializes in Middle Eastern food and based on our sampling, it's very good. We both had a lamb dish, wonderful. I'll bring the car back Wednesday and then tackle boat projects in earnest, I have a long list I won't bore you with. 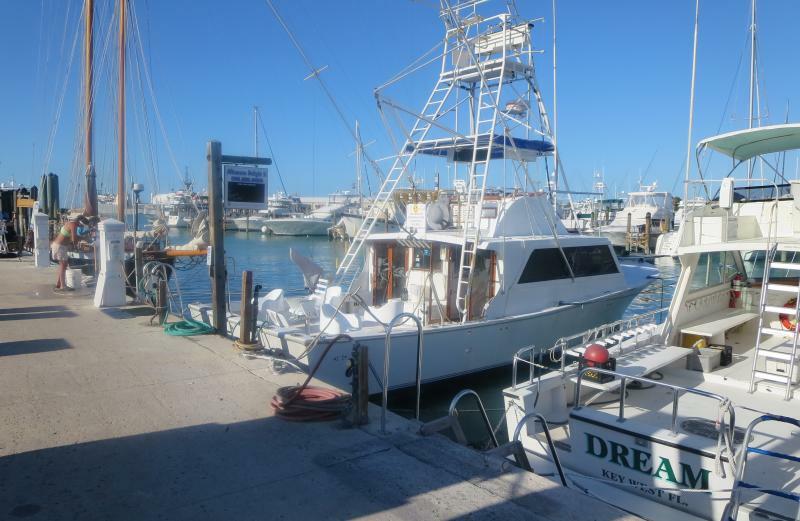 We have the last dock at the Key West Bight City Marina in the direction of Schooner Wharf. It's very convenient for shuffling over to see what's happening there. They have someone playing all day long. 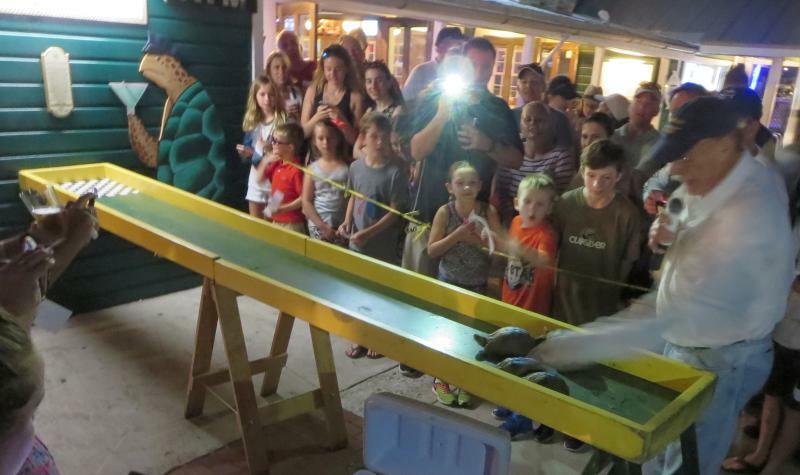 BO's Fishwagon, on the other hand, only has entertainment a few nights a week. Their best known band is Barry Cuda's every Friday night and the place is packed for them. A lesser know band plays Thursdays or Mondays and they are very good. It's composed of a guitarist, two violinists, a drummer and an accordion. There were people dancing in the aisles to the music (but not me, no talent there). A great deal of the attraction of Key West is just wandering around and finding music that's fun to listen to in places you don't expect. Hoolie and I stood in the entrance listening for almost 1/2 hour. The place was packed, nowhere to sit. We took Hoolie over to the dog park again and he got a good run in but it was hot, around 80. So we quit early and cooled off on the way back to the boat. I'm sure that we'll find that lot converted into condos at some time in the near future but we'll enjoy it while it lasts. On Tuesday we get a car for exploring Key West, probably the south end of Duval Street for starters after a provisioning run in the morning. Every morning I walk Hoolie by the Wyland mural by the docks. 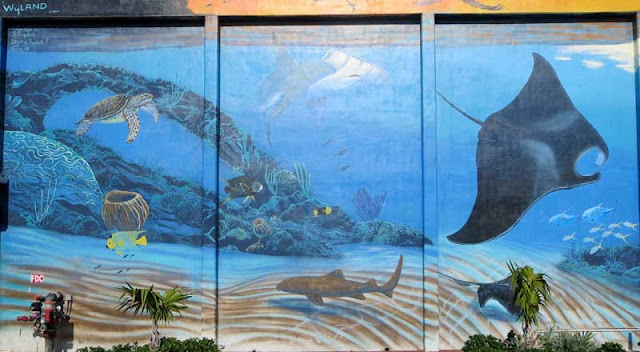 Every few years Wyland will repaint the mural to keep it fresh. He has painted over 100 mural on various public buildings all over the world across five continents. 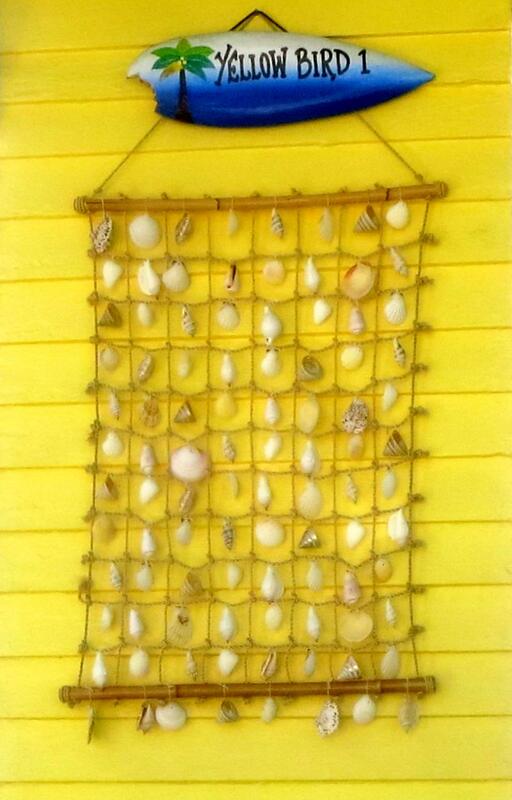 They are ocean scenes and promote awareness of ocean ecology. It a nice use of a space that would otherwise be bare. I see the one pictured every morning. The Waterfront Brewery seems to be doing well and they've invested in some expensive iron work at the grand entrance (see photos). It's one of the few (if not the only place ) that has full sized pool tables for use (9 feet, not the bar sized 8 or 7.5 ft size). They have a full menu and seem quite popular. 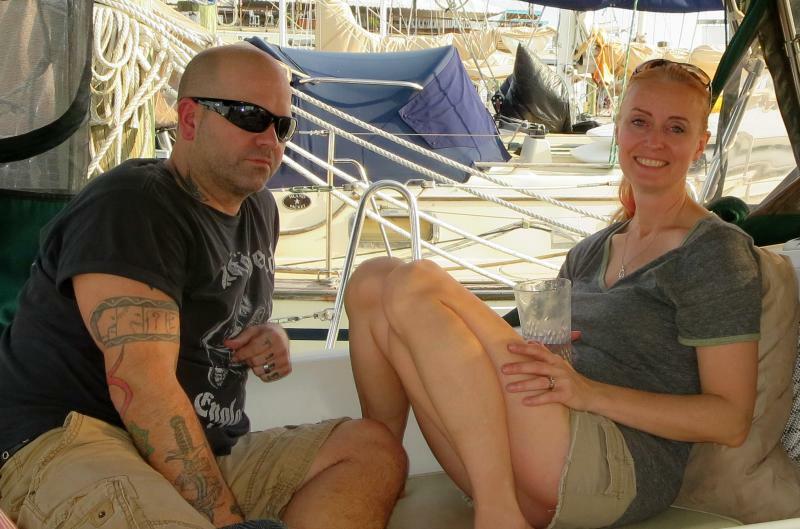 They have a view of the harbor so they can dine and watch us enjoy our wine on the back of the boat. I think we have a better view. 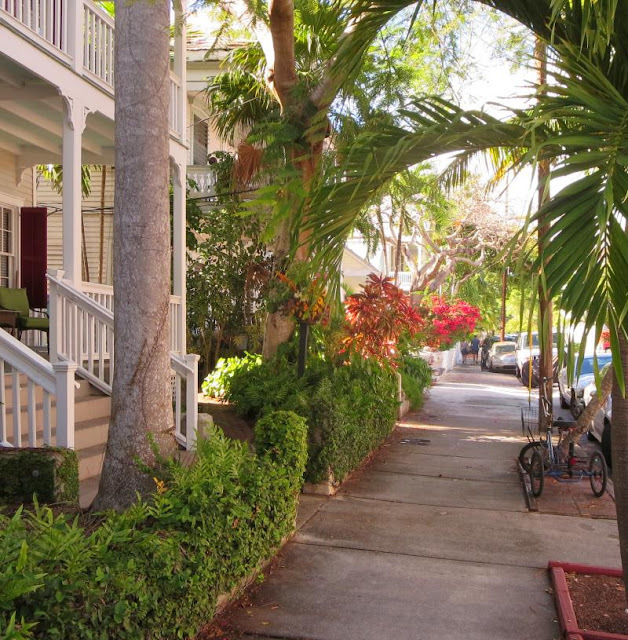 Mainly we're just relaxing on our boat and enjoying walking along the Key West streets. We chose a different path each day and the flowers are coming into full bloom, very pretty. There were about a hundred booths of this type. The quality of the exhibits was much improved over last year. The big event of the day was walking do Caroline Street to the Art Festival. It seems to grow in size every year but this year the quality of the artwork was a step above last year. Out of the hundred exhibitors there were a dozen that would qualify as fine art and with prices in the range of $2000 to $5000 per painting. Each painter seems to have found his or her niche. Some focus on photo-realism with oils or pastels and some tend to almost abstract. They were all very accomplished in technically proficiency. 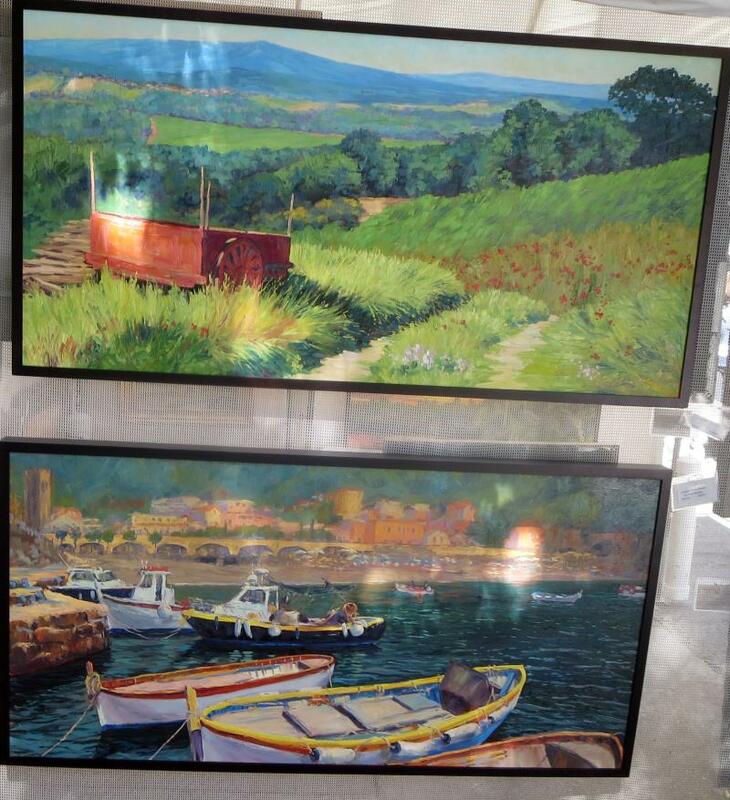 Most booths have "Do Not Photograph" signs up, the paintings are copyrighted. I was allowed to photograph this one. All that reminds me of an art exhibit we saw in Maine where Andrew Wyeth held forth. We saw a local exhibit there where the artists were every bit as good in technical details as Wyeth but yet the paintings just didn't have the same impact. The difference was in the composition. The details in the arrangement of the subject matter in the picture was paramount. It made all the difference between a very good painting and one that would stand the test of time as something you would want to look at again and again. For example, "Christina's World" is an example of outstanding composition. Any number of good painters could have done the painting technically but it took Wyeth to put the parts together for a gripping scene. So it was with the paintings we saw today. They were very good but not in a class of a Wyeth as to composition but then who is? Ann stopped and chatted with all the painters and had a great time learning the paper and techniques they used. 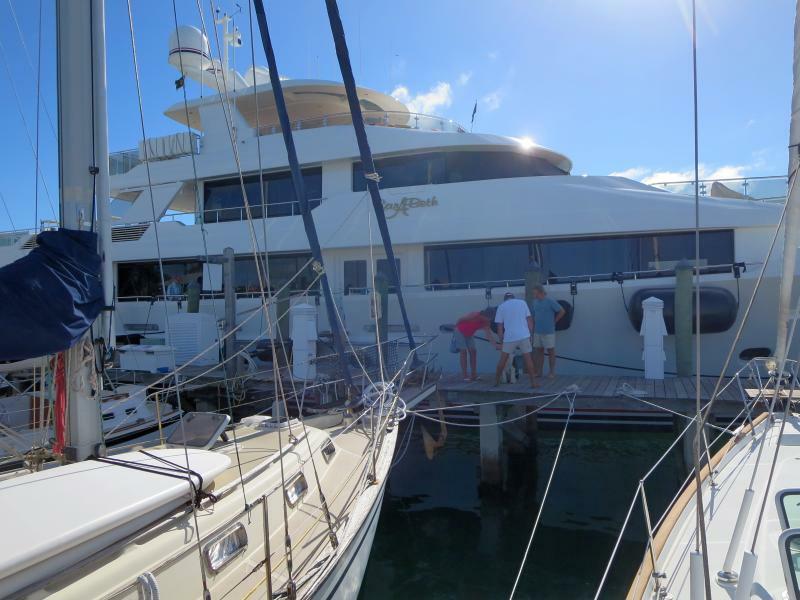 She returned to the boat and started working right away on her present pastel of three palm trees. 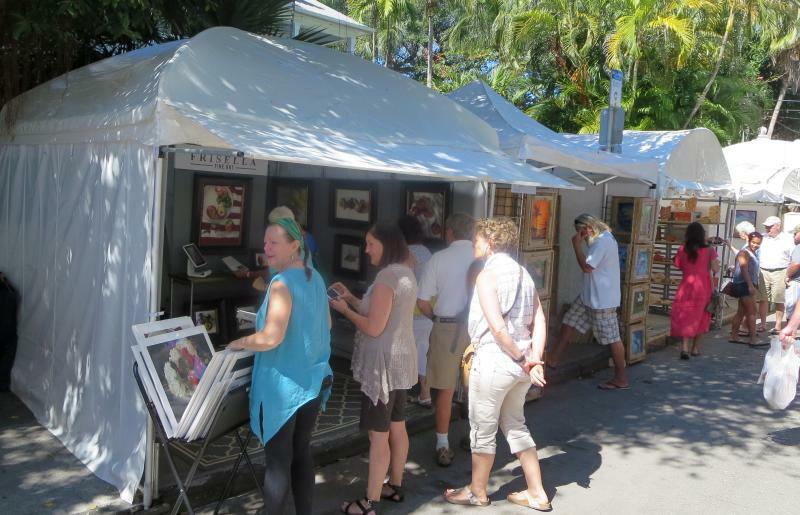 The Art Festival will continue on Sunday and if you're in the area, be sure to see it, it's very worthwhile. 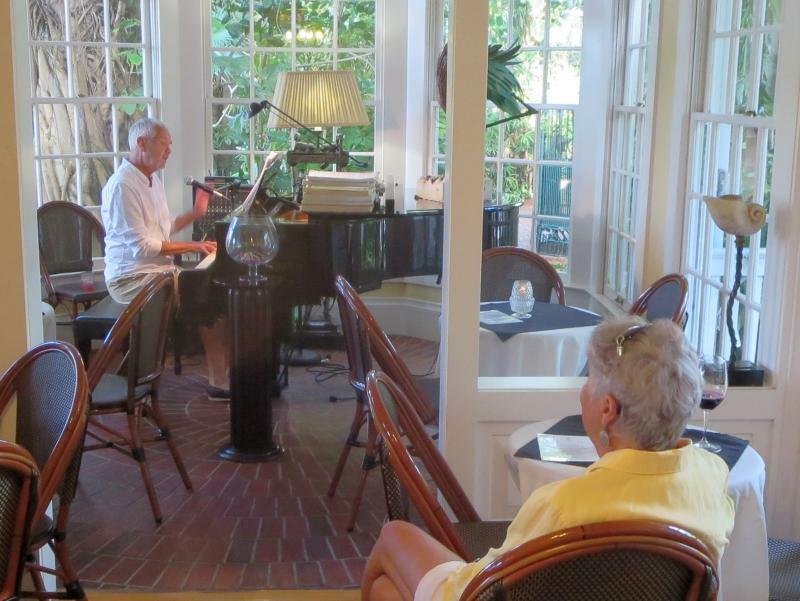 One of our favorite things to do is to listen to Jimmy Olsen at The Gardens Hotel in Key West. It's rated in the top 1% of all small hotels in USA. It has gardens open to the public for enjoyment and best of all, it features Jimmy Olsen on the grand piano every Thursday night starting at 5:00 through 7:00. He plays Broadway musicals mostly and always interacts with the crowd. Another attraction is the wine bar. 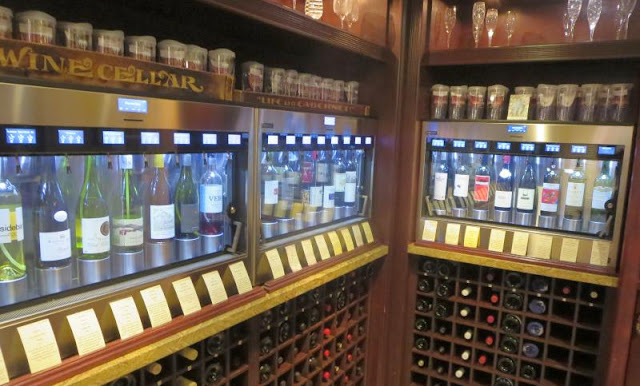 They have several dozen wines in automatic dispensers that can be purchased by the taste, slip, or 1/2 glass using a card with a chip embedded that you "load up" with money at the register. You have a wide selection of white and red wines to enjoy as you listen to Jimmy play on the grand piano. After the Jimmy we enjoyed a walk through the tropical gardens started in the 1930's. 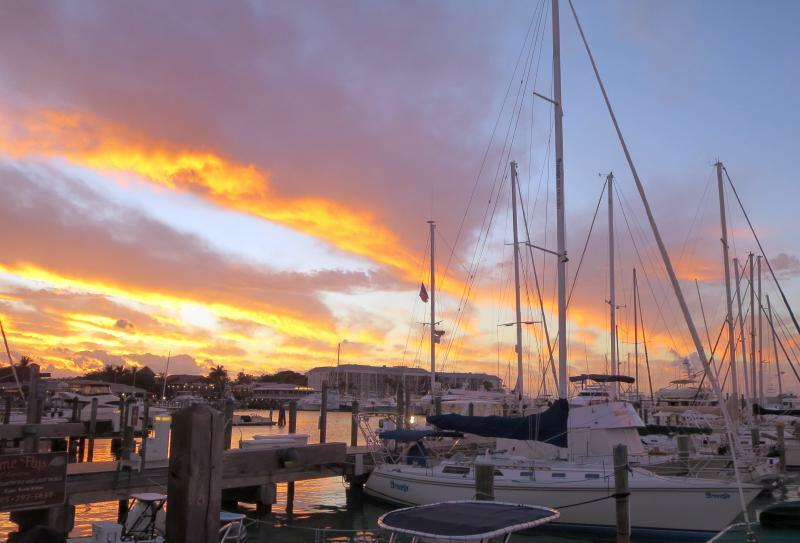 It's just a wonderful way to spend the early evening in Key West. Best of all, it's never been crowded and Jimmy recognized us from last year. 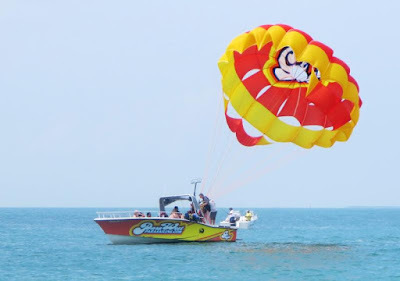 Key West has a dry season that runs from December through April so in the present time period, there is little rain. We've seen rain about once every two weeks during our visits in the winter. Today was one of those rare days with a downpour. It only lasted an hour or so but it's enough to put a damper on Key West festivities. No boats went out in the morning for day sailing. With the rain, we stayed inside and watched the weather radar for an opening to get laundry done which we did. In the afternoon it was walking time. One great thing about Key West is the variety of routes you can take and not repeat yourself when walking. 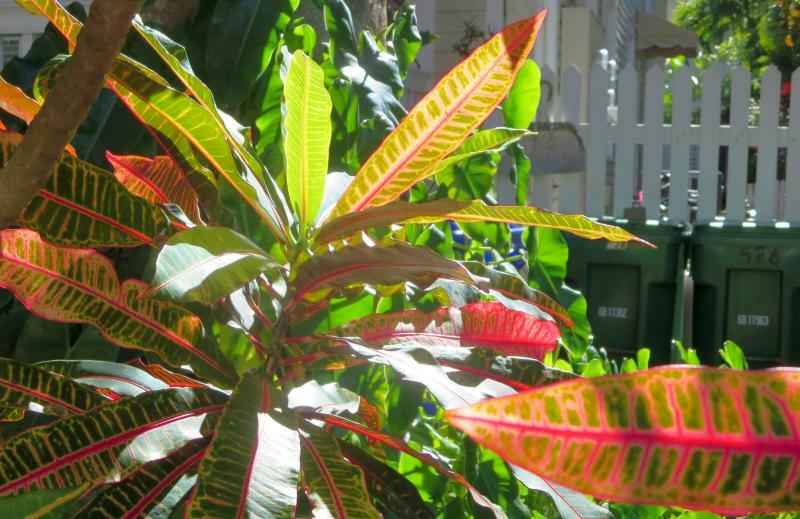 The rentals all have plantings to take advantage of the tropical climate. There is a profusion of flowers and plants of all kinds imported from equatorial regions from all over the world. 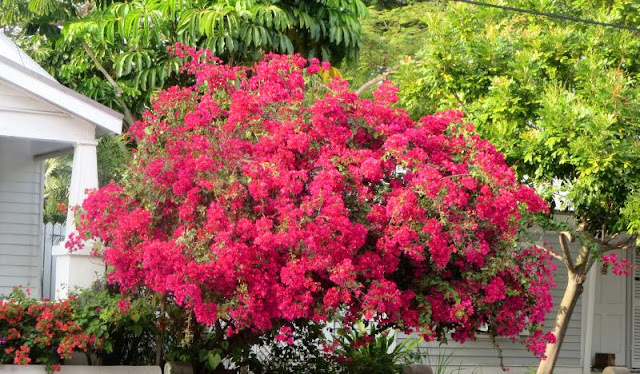 It makes for a showy area to stroll. This morning I noticed that the Strataglass in the front windshield is cracked. It was getting cloudy anyway after 10 years or so in the Florida sun but we hadn't intended replacing it until our return north. Now we're looking for a local canvass shop, not cheap. We are getting back into the routine of just the two of us. It has suddenly become very quiet on the boat. All the grandkids have blocked out their calendars for the summer time trip to Long Island Sound so we have that to look forward to. This is the first blog in a long time without Finn, He left this morning with his parents and now he's back in snowy Pennsylvania. Finn will be missed. He's a great kid but he has rejoined his class and I'm sure he'll expand on his exploits aboard Fleetwing. He's read Treasure Island so he has lots of arterial to work with. 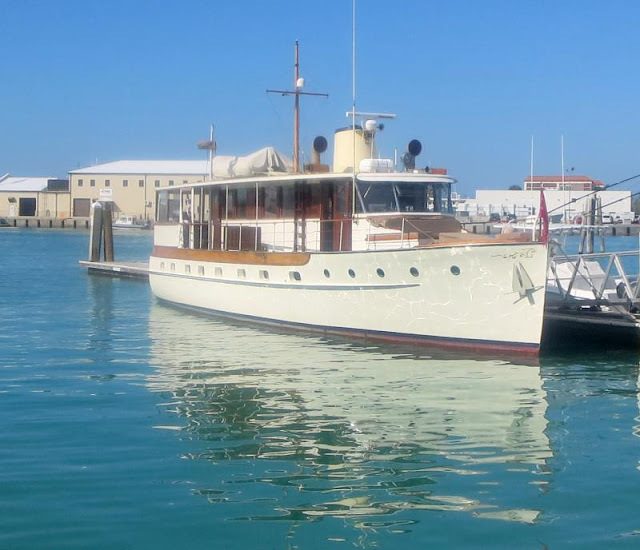 We celebrated today by starting with wine aboard Fleetwing with Bill Spencer and Bill Washburn, both are members of the Poughkeepsie Yacht Club. They vacation down in Key West for two weeks (only two weeks!!!) so we found a night to go out together, great fun! We started out with wine on the back of Fleetwing and that proceeded with wine at Mangina Mangina so we're pretty well snookered. 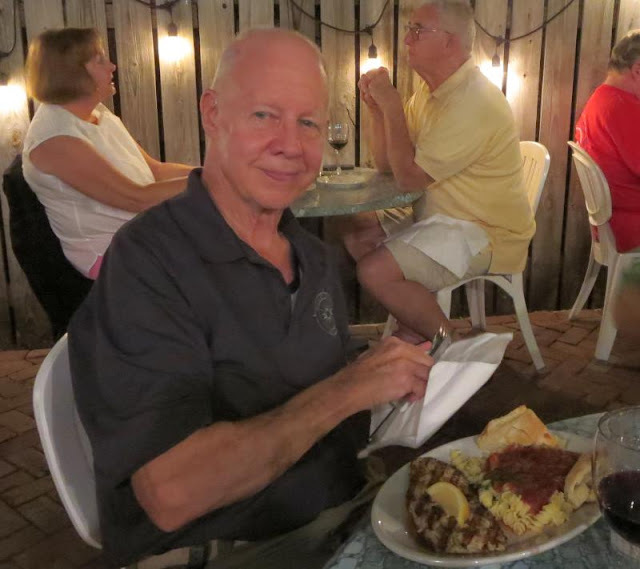 However, the dinner was outstanding and I would highly recommended it, we had a great time. 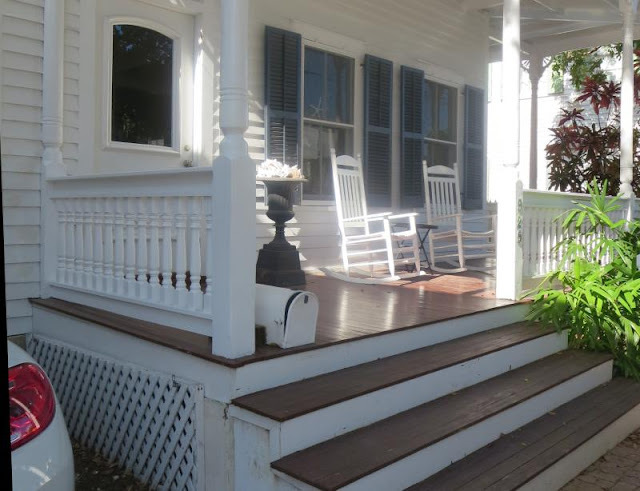 An inviting front porch. Some come to just enjoy the weather and watch the world go by. I hate to say this but this is my last entry. LLL Tomorrow I am going to my real home. We did go on a long walk in the afternoon. We went into a shop that was chock full of CANDY!!! I got a big bag of candy. Tonight we are having PIZZA!!! My pizza is going to have cheese. I LOVE CHEESE PIZZA BY THE WAY!!! Tonight we are watching “Open Season Scared Silly”. I heard it’s a good one. That’s all we did today that was worth going on the blog till next time BYE!!! The morning was still spent on homework, even on the last day on Fleetwing. Finn has to show proof of his homework in order to re-enter his class at school. We received notice his homework was accepted and he's good to go. Every MWF at 7:00 there are turtle races! 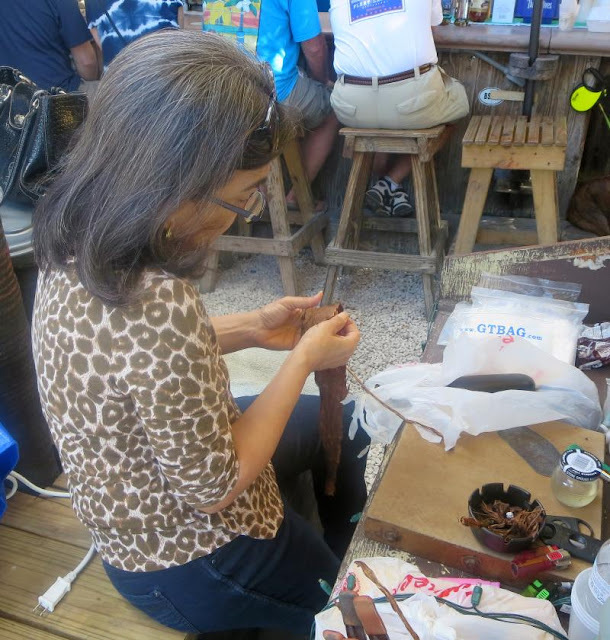 The afternoon was spent walking around the downtown area and visiting the It's Sugar store on Duval Street. I think they will have a sugar high on the trip home. One last trip tonight was for ice cream so now they are all set for tomorrow. They will be leaving from Miami so they will need an early start. It's sad to see the last of our crew return north. Now it will just be the two of us taking Fleetwing back to Poughkeepsie to arrive late May. 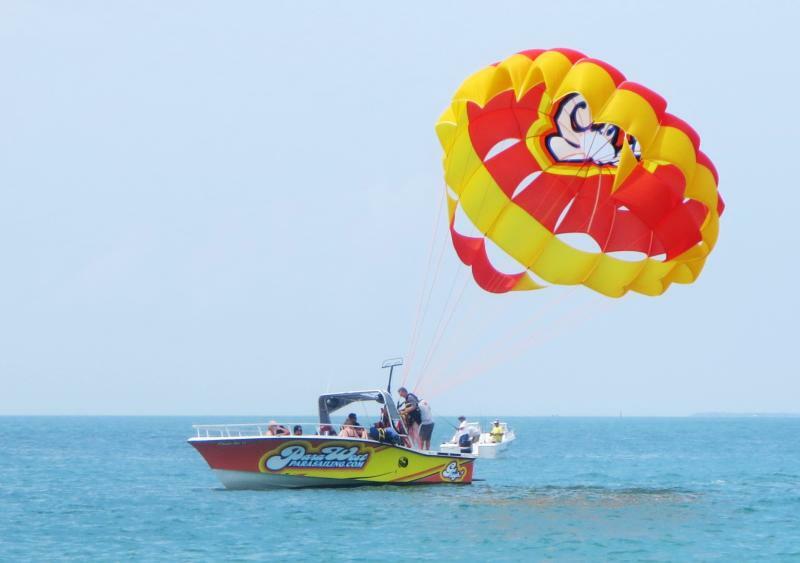 But before that, we have another month down in sunny Key West! 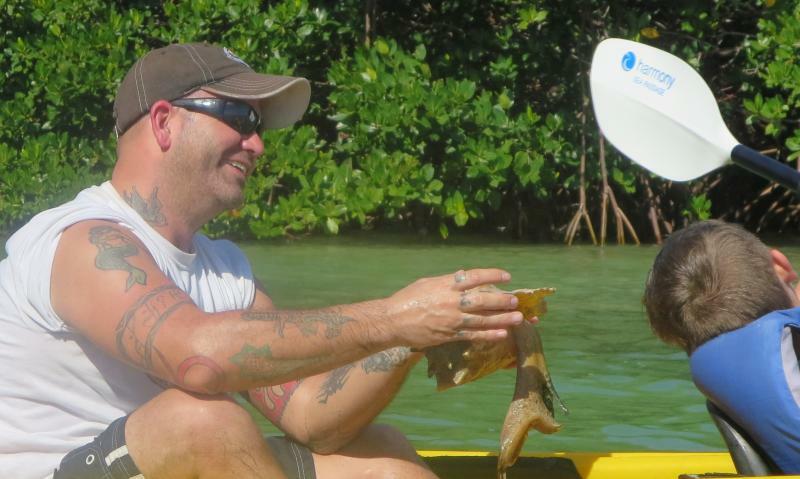 Mike is holding a conch shell with the critter partially coming out, it's big! In the morning Finn took his parents and Rowan to the parrot rescue house where we went earlier this week. This time Rowan got to hold the parrot. 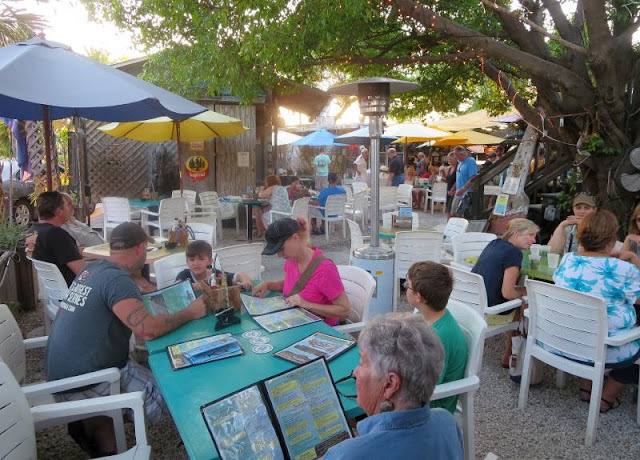 The place is an oasis in the middle of Key West. 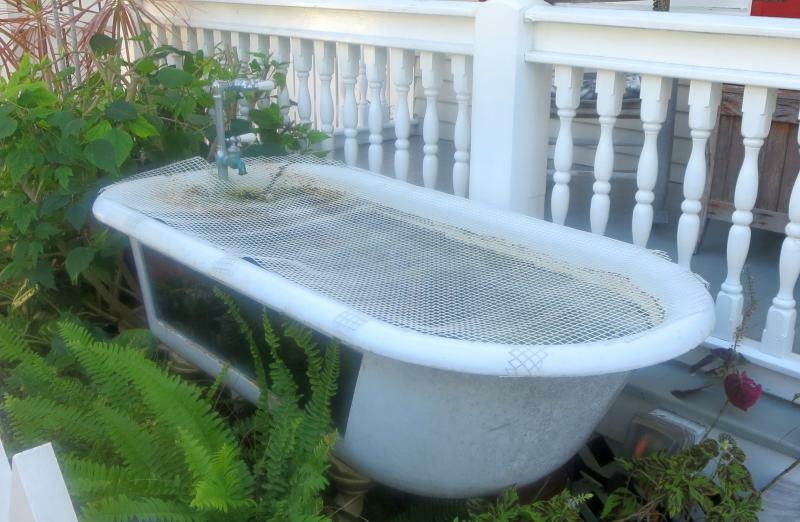 Once in the backyard of this house, you wouldn't know there was anything else around. The keepers imported nut trees from South America to provide food native to the parrots. After 25 years, the trees are fully grown. 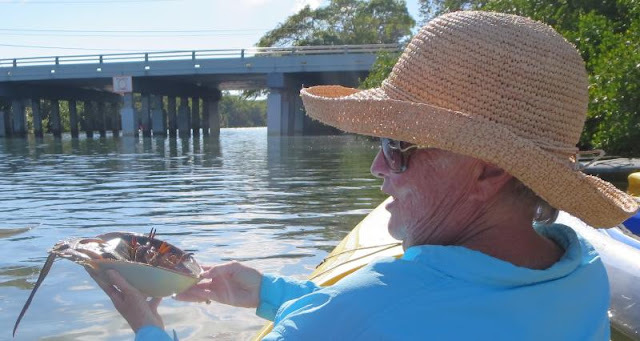 At Lazy Dog Adventures you can take a tour or just rent a kayak or paddleboard on your own. The six of us went on an eco tour led by one of the staff. It's a two hour tour and the paddling is more than relaxed, especially if the tide is against you. Still, it was interesting with the creatures brought to the surface by the guide for discussion (sea cucumber, live conch that extended out of its shell, a horseshoe crab and more). It was an interesting tour for both us and the kids. It's just one more full day before everyone has to return to the cold north. Today was great. We went on a walk. It was fun until Rowan said he wanted to go on a bus tour. I really hate bus tours. There is always some one yelling so you can’t hear anything. So really it’s a boring bus ride. Rowan also gave us a tour of the harbor. He made stuff up like the bird of knowledge or the stairs of hopelessness. # it was cheesy. That’s all the stuff we did that was worth going on the blog BYE!!! We had lunch at Garbo's Grill again which is a very good stop for fish tacos, Korean BBQ, shrimp Tacos and, of course, their famous Umamiburger. 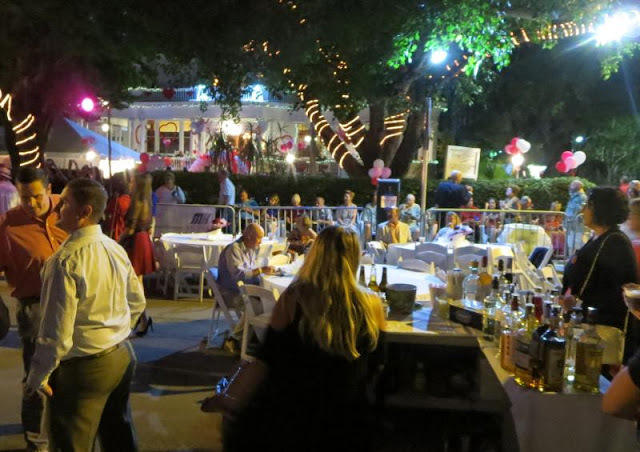 From there we took at stroll down Duval Street to tour three of the art galleries we like the best. 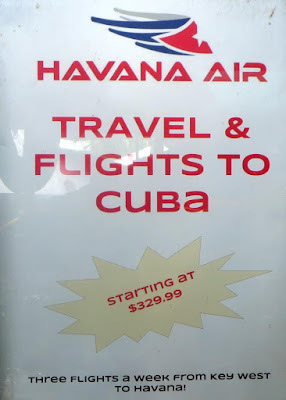 Along the way we saw an ad (see photo) for flights to Cuba. 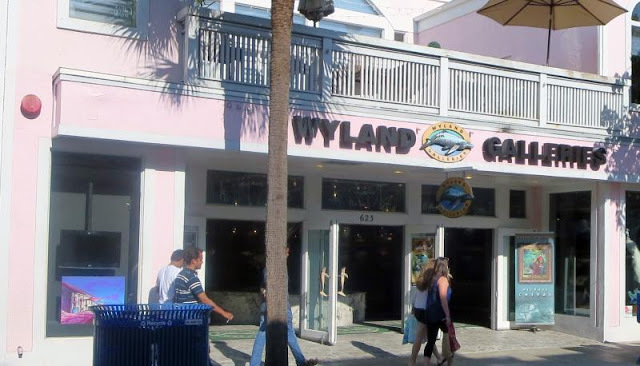 We most like the Wyland Gallery. 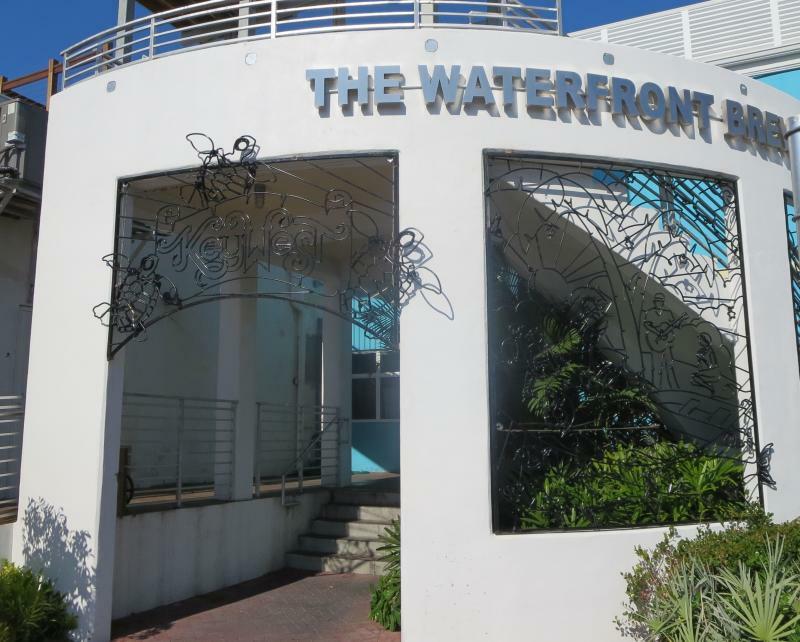 Among other things he does murals on buildings for aquatic scenes all over the world with one painted on a building by the dock. There are often other famous painters doing exhibitions in his studio during our stay. On Saturday we plan on sailing if the weather holds up. I don't think Finn was supposed to repeat that his dad told him to say it! Oh well, Finn had fun. In provisioning there are two choices, either Publix or Winn Dixie. Of the two, Winn Dixie is the better choice unless you don't care about prices. Publix in Key West is way overpriced. Winn Dixie had boneless chicken breasts for $1.69/lb while Publix wanted $4.50 for the same thing. So we stocked up for the next few weeks. The flowers of Key West are starting to come out! 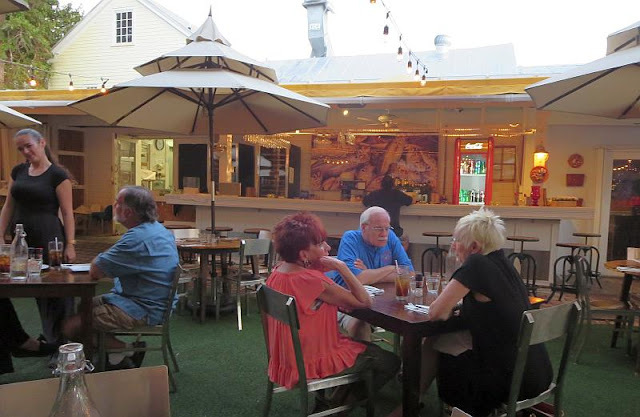 The only choice in Key West downtown is Faustos which is about 10 minutes away walking from our dock. The only problem is that the prices are outrageous ($49 for one fillet mignon steak).The other items are not so overpriced but still very high. You could use the city bus (50 cents for seniors) which stops right in front of Winn Dixie but you have to pay good attention to the bus schedule which is not very reliable, it's Key West after all. Surprisingly, Key West Transit does have a website that shows the location of all of its buses in real-time on a map with an estimate of arrive times at any bus stop. There are a bunch of 7/11 type stores but they don't carry much beyond drinks, milk, and eggs. More exploring Friday. Today was great!!! My parents got hear this afternoon. Diner was good. 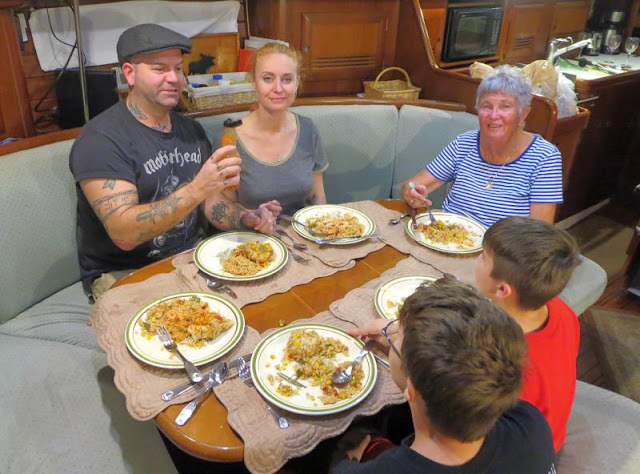 We had a macaroni EXPLOSION!!! You see I was eating a cup of macaroni when I put my spoon down then my cup spilled. I got so mad I wanted to indent the Sponge Bob macaroni into the table! Last night I simply could not sleep. Well I did sleep a little. I slept for 4 hours. The rest of the day was work. I did finish Treasure Island, so the half idiot Ben Gunn found the treasure. That’s all the stuff we did today that was worth going on the blog BYE!!! We watched Finn's parents' flight on the internet as it took off and headed south. Finn, of course, was all excited. Still, he had to do his homework and that took all morning. They left winter and found summer in Key West! Thursday will be a provision day and then we'll decided how best to spend the short, one week of their time with us. I had rented an HD and internet connection with Xfinity (Comcast) and I'm taking all that back for a refund on Thursday. The marina OnSpotWiFi internet connection is good enough and we never even used the HD part of the package. With all the options for streaming over the internet, you really do not need a TV signal anymore. Here's another solution to getting a dog off a boat. I just carry Hoolie over the bow. Happy Valentines Day everybody!!! Today we started with the daily morning walk, nothing really interesting there. We walked 37min. Most of the day was filled with schoolwork. We took Hoolie to the dog park. I threw the ball and chased it. That was fun. I did my horn. I have been working on the Hobbit theme. It is not easy. Tomorrow my mom and dad are getting here. I just can't wait for them to get here. That’s all we did today that is worth going on the blog. There was a lot of getting the boat ready for the next crew, Finn's parents are due to arrive around 4:00 pm on Wednesday. He hasn't seen them since the first of January. They are spending the night in Washington, D.C. so they can catch the early flight out of Dulles for Ft Lauderdale. We took advantage of the dog park again which exercises not only the dog but also Finn. Our favorite time of the day is sitting on the back of the boat at 5:00 pm and watching the harbor. It's a quiet time of the day and the sun is not so strong and there's usually a gentle breeze with the temperature around 70 or so. Tonight I took Finn for a walk and we passed by the annual Wesley House Valentines Day dinner on Caroline Street. The cost is $50 each but we didn't attend. We'll celebrate later in March after all our guests leave. There was quite a crowd there tonight. Today was so cool. We went to a parrot rescue. There are so many of them!!! I EVEN GOT TO HOLD ONE!!! 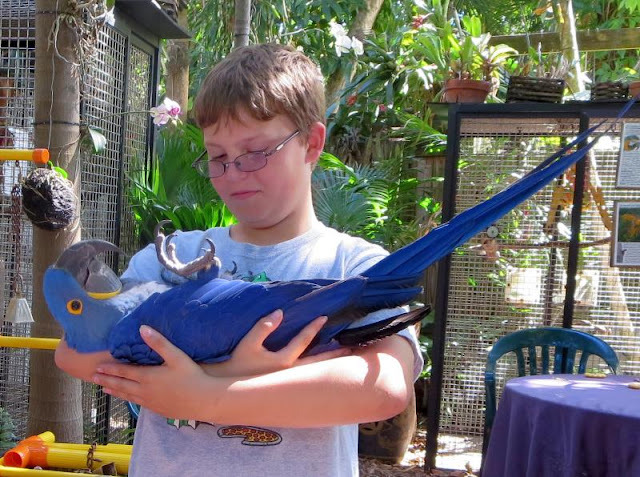 It was a blue macaw but it was as cuddly as a cat. Its name is baby. The other guys kept squawking in my ear. Anyway I am almost done with Treasure Island. I have 1 more chapter to go. In the morning we all went on a walk. All we saw were chickens. In the morning we did work. I started measurement. It’s not easy. That’s all we did today that deserves to go on the blog BYE JJJ!!! Finn was allowed to hold one of the parrots. Ann has places she favors for getting her hair done. 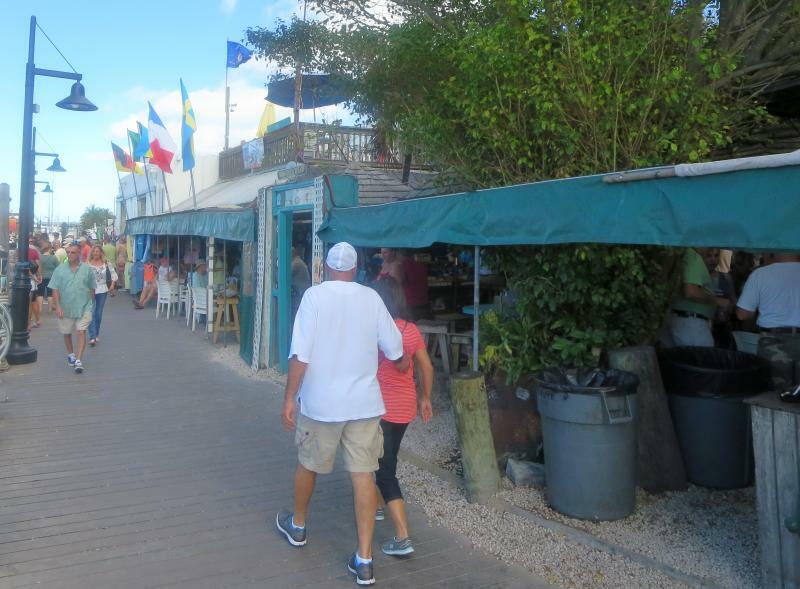 She likes a shop at Fernandina and when in Key West she has a favorite there too. However, the one in Key West went out of business! 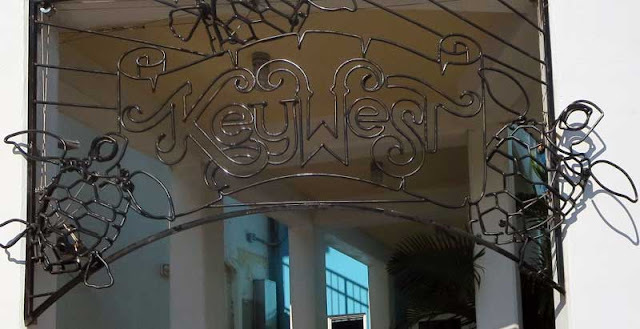 That's the problem with Key West, there's a lot of turnover. 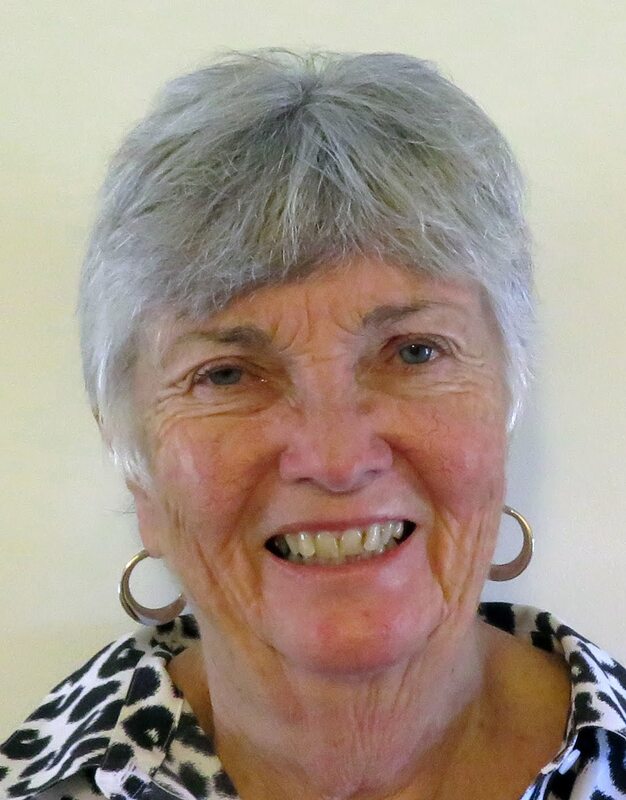 Luckily, the same shop was taken over by another stylist so Ann took advantage of the changeover to get her hair cut and styled. I thought it looked nice and Ann's happy with it. 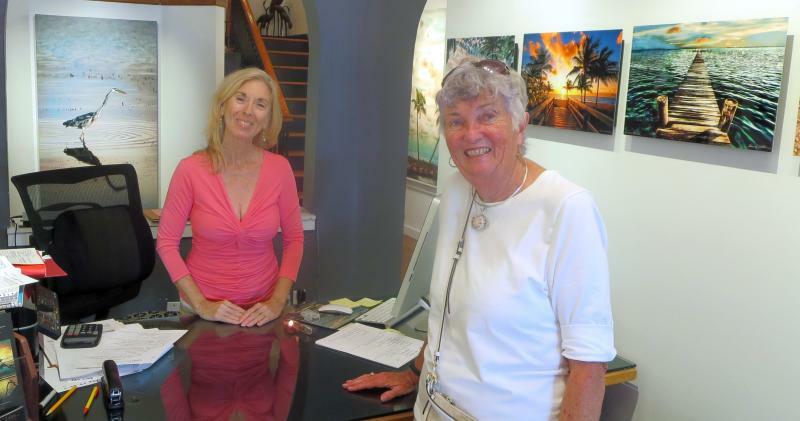 They have two shops in Key West, Ann went to the one on Simonton Street. 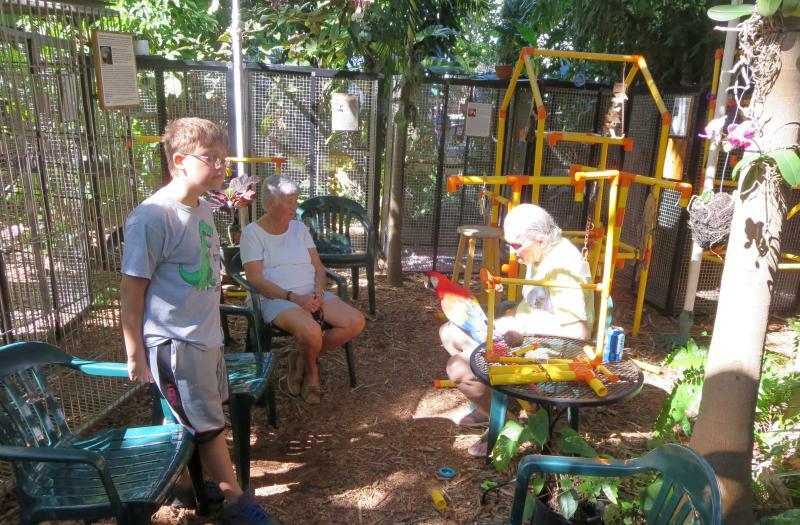 In the afternoon we visited the parrot rescue house at Nancy Forrester's Secret Garden. It's a mom and pop affair and they have about 24 parrots spread around their backyard. 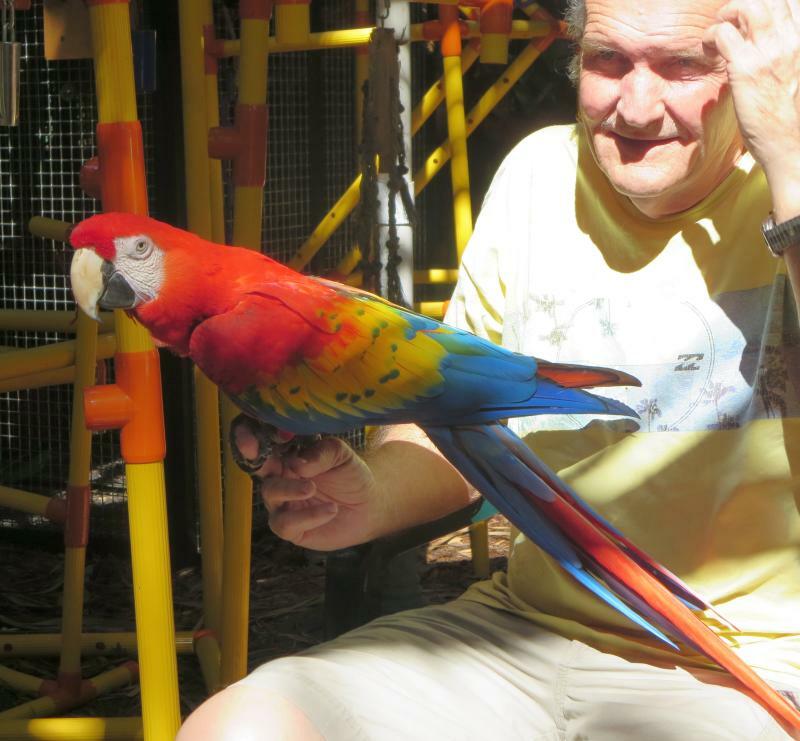 We looked in all the cages and then had a great conversation with the parrot couple. As we sat and watched, they took parrots out of their cages and interacted with them. It turns out that they are very social animals. They like to be petted just like a cat. In fact, they have to interact or they grow bored and suffer. The wife related that the parrots like to play hide and seek when they are free in the house (they take them inside every night). You can see Finn holding one of the parrots as it lies on its back, totally relaxed and enjoying it. Both of them cautioned never to buy a parrot unless you're willing to make a lifetime commitment, they live a very long time - comparable to humans. They get their parrots often from people that buy one on a whim and then get tired of them after a couple of years or even sooner. They demand attention and can get very loud if ignored. It was a great session for Finn and we chalked it up to science day for Monday. From the outside it looks like any other house. One more day until Finn's parents arrive. He's been away from his family since the beginning of January but he does talk to his mother every night. Today was not verying exciting. We had Danish for breakfast. It is SOOO GOOD. Mine was chock full of CHOCOLATE! I love chocolate by the way. We also went to the dog park. There where so many balls. Hoolie was in heaven by the way. The only problem was that he kept getting distracted. I had a good practice on the horn. We’re learning the 2nd song. But there are so many notes it’s hard to breath. So I haft to stagger breath # it’s not easy! That’s all we did today that should go on the blog BYE !!! Well, a few more "O's" slipped in but not too many. In walking Hoolie today I saw noticed that we have many more dinghies at the dinghy dock than ever in the past. 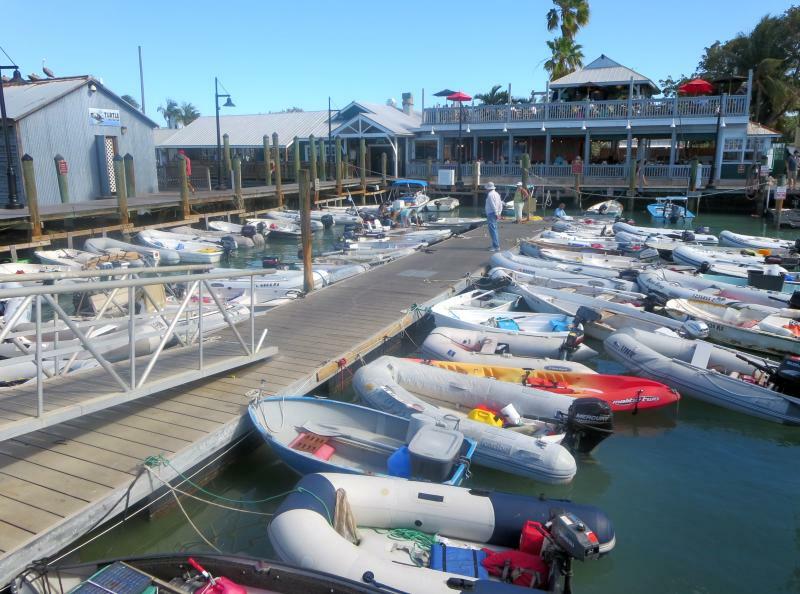 It looks more like Block Island than Key West at the dinghy dock. In all the previous 6 years we've been here, the dinghy dock has never been more than one deep, not so this year. 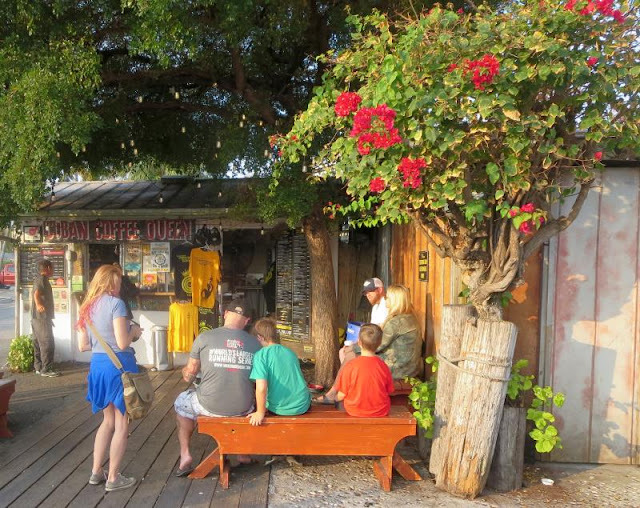 I took a walk over to Schooner Wharf, it's only about 200 ft from our dock and it's one of the great attractions of Key West. 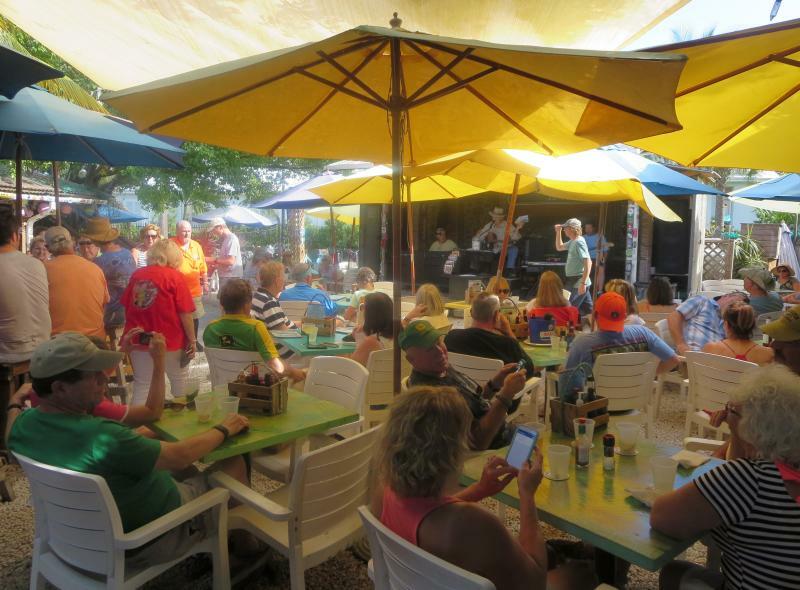 Where else in Key West do they have two Happy Hours with the first one from 7:00 am to noon! They even have a cigar roller right in the restaurant which, of course, has no roof, just the sky. There are also no sides, it's open to the outside. They do have a stage where they always have someone playing, even during the afternoon hours. We are right over on the next dock out. Note the absence of walls. We often go over with Hoolie in tow and sit for awhile to listen to the performers, they always have someone live. 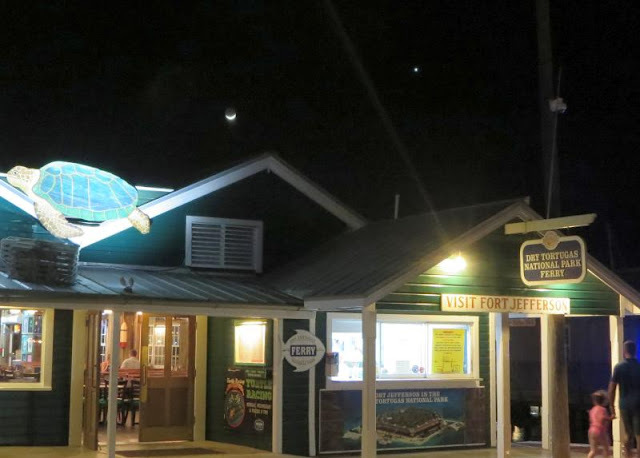 It's just a great way to enjoy the warm, night air of Key West. Today wad GREAT!!! For lunch we had burgers with a twist. 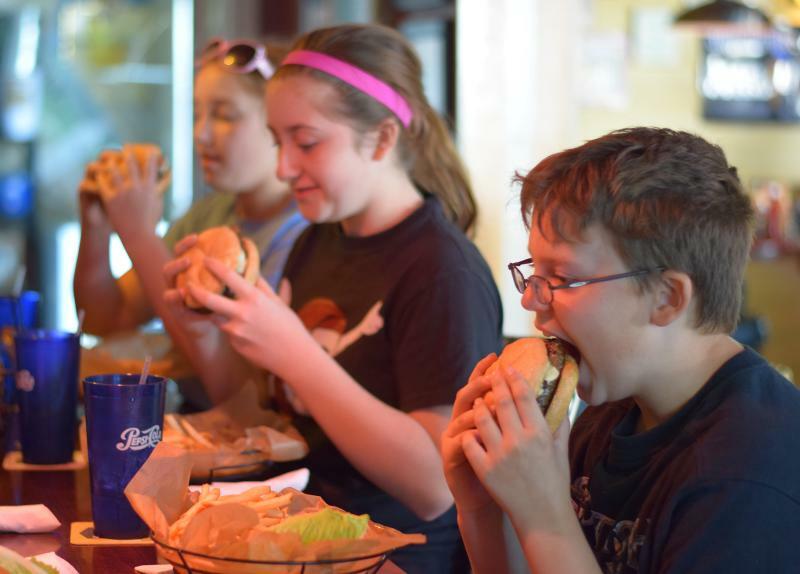 We tried to see who can eat their burger the fastest. Natalie won but I came in 2nd place buy a French fry!!! We also went to a Cuban museum. It was not very interesting. You see it was all written in Cuban so I could not understand it. We went to a French pastry shop. Their pastry is SOOOOOOOOOOOOOOO GOOOOOOOOOOOOOOOD. That’s all we did today BYE!!! 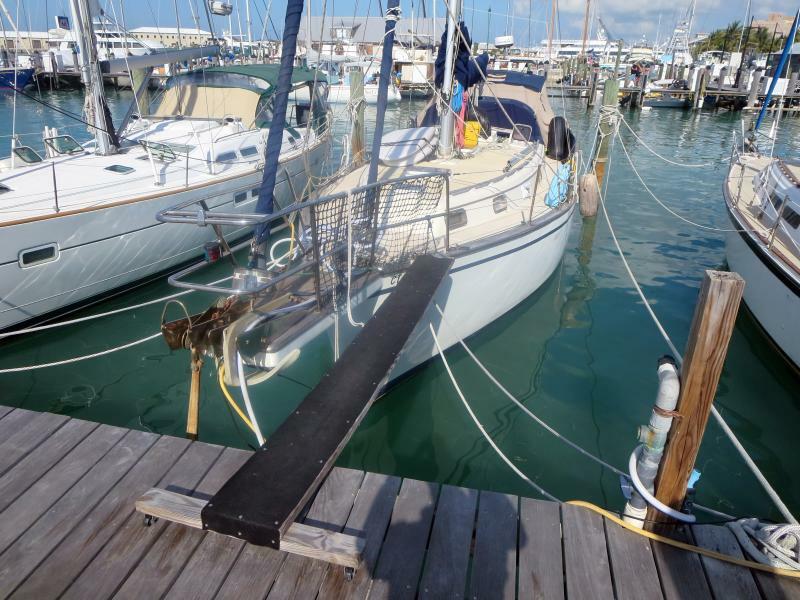 We had intended going for a sail but when the winds came up at 30 kts overnight, we thought better of that plan. 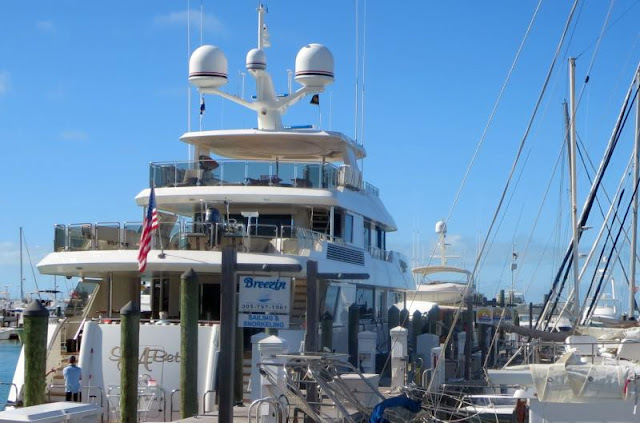 We stayed at the dock and the gang explored Key West and had the second annual burger challenge. The intent here is simple enough, just be the first to eat all of your burger and fries. Sarah and Finn faced off but they were surprised when Natalie finished her burger first! With that Finn had a second wind and finished just ahead of Sarah! So now we'll have to wait until next year for the 3rd annual burger challenge for a rematch. 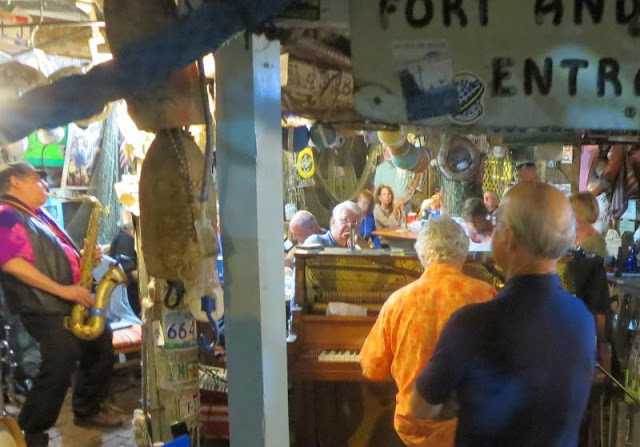 Barry Cuda was playing as usual on a Friday night at BO's Fishwagon so we all trooped over to listen after dinner but managed to squarely hit his break time. No Barry Cuda! The gang is out now walking around the dock area for their last night out before having to leave on Saturday. A week sure goes fast. Sarah was very sad in reaching the end of her stay. This summer she'll join us and her other cousins for a week on Fleetwing going down the Hudson River and across Long Island Sound to Branford. Two grandparents and four grandkids, ought to be an adventure.